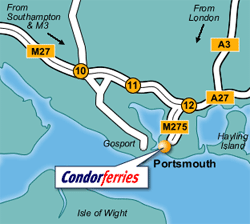 The Portsmouth Terminal at Condor Ferries is easily accessible and offers a range of facilities. Our services operate between Portsmouth and Guernsey, Jersey and Cherbourg. Take a look at the Portsmouth Destination Guide and Portsmouth Ferry Times. If you're travelling to Guernsey, Jersey, Cherbourg or St. Malo from our Portsmouth Terminal why not take time to look around this beautiful historic port. Discover the world famous historic ships – HMS Victory, the Mary Rose and HMS Warrior 1860 that have shaped British history at Portsmouth Historic Dockyard. Home of the Royal Navy, other attractions include The Royal Naval Museum and the RN Submarine Museum. The Blue Reef Aquarium in Southsea, was voted Visitor Attraction of the Year by Tourism South East. It is situated on Clarence Esplanade, between the two piers overlooking the Solent. The aquarium houses sea life ranging from local marine species, to shoals of tropical fish in a gigantic ocean display, complete with underwater tunnel.The Pyramids Centre is a recreational area that allows you to escape to a unique water and tropical atmosphere. The complex houses an indoor swimming pool with a wave machine and waterslides. Portsmouth is the birthplace of Charles Dickens, his house in Old Commercial Road is now preserved as a museum furnished in the style of 1809. The house includes an exhibition room displaying memorabilia and prints illustrating Dickens life and works. With an irresistable array of culture, history and heritage Portsmouth is fastly becoming Britains most popular harbour.In the centre of Portsmouth, the Cascades Shopping Centre offers high street names such as Marks & Spencer, H&M, Woolworths and BHS. Alternatively find some designer bargains at Gunwarf Quays, where you will find more than 90 designer outlet stores with an incredible range of fashion and leisurewear, household goods and toys, with savings up to 70% off high street prices. There are two main eating areas in Portsmouth - the city centre and Gunwarf Quays. The city offers a complete range of good eating, from restaurants with panoramic views to intimate bistros, offering the full spectrum of international cuisine. Located on the coast of Hampshire, Portsmouth offers miles of waterfront together with a mix of historical, cultural and sightseeing opportunities. A lively arts scene, fine dining and specialist shopping makes Portsmouth an ideal destination.